Few topics are capable of eliciting a more visceral response from people with diabetes and their loved ones than talk of a cure. So many emotions come rushing to the surface so quickly. I don't know about you, but for me, having any sort of reasonable, unbiased conversation about any potential cure is next to impossible. Anger, frustration, pain, sadness, cynicism--all these things rush to the surface. 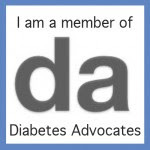 I have lived with Type 1 Diabetes for nineteen years. There are people I've met who've had it for more than twice that long. This is our reality. This is our life. When we have conversations about a cure, words must be carefully chosen. It is important to remember what an emotional topic this is, that words hold more power in this context than they typically do. I've written about this before, but I don't expect to see a cure in my lifetime. Do I believe that all types of diabetes will be cured one day? Absolutely! But do I expect to still be around when this happens? No. I operate under the assumption that I will live with Type 1 Diabetes for the rest of my life. It's part of how I cope. I do want to emphasize that I STRONGLY believe in supporting diabetes research and working for a cure! I believe that with all my heart. I support organizations who are working towards a cure, but I also believe in supporting research for technology and medication that will make our lives better. Like the Artificial Pancreas Project. Or glucose-responsive insulin. And there are many others. The point is, we need to have HOPE. Hope that help is coming. Hope that something better lies ahead. For me, that hope lies in things like the APP and glucose-responsive insulin. I hope and pray to see one of those things in my lifetime. For other people, hope lies in a cure. And that's ok. We need to take our hope where we can get it. I want to know what research is being done. What different organizations and companies are working on. I'm all in favor of whatever will help improve the lives of people with diabetes. But please, choose your words carefully. Don't make me any promises. You hold my heart in your hands. Perfectly said Jess. I agree! I have become a pessimist about diabetes because it is easier to never expect anything. An awful attitude to have but it's protection from a broken heart. I think words matter and when a source of them becomes unreliable it is time to treat them as such. I used the unsubscribe on DRI's email today. was the march 4th "i'm going to have a big announcement" guy just looking for attention? I cannot speak to what someone else's intentions are. I just wish it had been handled differently.